Whether you're a simple tourist or a professional photographer, Lapland is a truly magical place to visit. Not only is it the home of the starry skies and dazzling Northern Lights, but it's also home to Santa Claus and his reindeer - making Lapland the ultimate go-to winter destination. 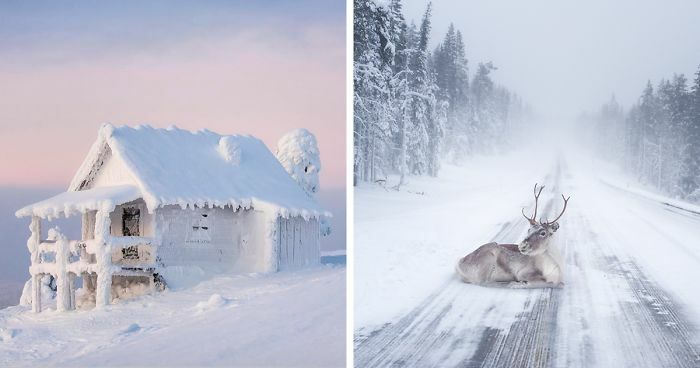 For all those who don't have the opportunity to visit Lapland or those who long it's beautiful sights, Bored Panda has put together this list of the best photos capturing the beauty of winter in Lapland. The best part? You can enjoy them all from the warmth of your homes! Keep on scrolling to take a look and don't forget to vote for your favorites. Been to Lapland in the winter time yourselves and have some magical pics? Add them to the list! I can't remember ever seeing a picture so stunning and unique.. The frozen window with the sun setting ( or rising) is beautiful.. My new favourite picture!!! So beautiful, makes me wish I was there even tho I hate cold weather!!! Finally, an accurate representation of what it feels like to sit in my office. If that's an outhouse, I would hate to make the trek to it. Wow wished I could see it for real, beauty. Quite surreal. It reminds me of "The Lion, the Witch and the Wardrobe" - the bit where creatures have been turned to stone and snow has fallen on them. It's like about five worlds in one photo ... Dang! Eat your heart out, Dr. Who! Move over Elsa, Anna, Kristoff, Sven and Olaf!! The Disney Empire is going down, Baby! The coloration and shading in these photos is spectacular ... I've rarely seen anything like this! This looks as if it's an underwater scene ... I know it's not but ... Sheeesh! Wow, living in Auckland New Zealand where we don't have snow, this place is hard to imagine it could be so beautiful. It's like something from a fairy tale book! This reminds me of 'The Nightmare Before Christmas '. Beautifully captured. A snow queen and her subjects, an emissary seeking audience. Beautiful! It could almost be a ghostly bird. Rather a big one, though! Looks like bears in the middle and a dragon on the right front laying on open of a rock with its tail in an 's' curve. One day me and my baby will see these ourselves by actually being there to see them and not in just a beautiful photo. Looks like an Angel, with a head, body and wings! The night is dark and the winter is coming.. it's like everything and nothing at the same time! Is the shading of the sky real or is it a filter effect?